Kid’s room’s can be a challenge for most mom’s. It can be expensive to redecorate a bedroom, for anyone. Never mind a child that will probably outgrow the room in a year. Or the decor, for sure. So, when it became apparent Levi would need his room redone I set out to keep costs down and create something that could grow with him. A boy’s bedroom on a budget of…$150 or so. That’s all I was willing to spend. For new bedding, curtains, furniture…whatever. Obviously with a budget that low, I had to get creative! I’m sure many of you are in similar situations! The first decision Levi and I had to agree on was the paint color. He desperately wanted bright blue walls. I desperately wanted neutral walls knowing full well that his tastes would change again. We compromised with neutral on 3 walls and a very cool focal wall in bright colors. Use neutral colors on the walls to get the most longevity out of the room. Color can be placed in with fabric, stencils, and more. A stenciled focal wall is a fun way to add personality in a temporary way! Use a high-gloss paint in kids rooms to make it easy to clean! I knew I needed to get rid of the giant bunk bed that was eating up valuable space in the bedroom but I hesitated on what to replace it with. When I asked Levi what he wanted, he said a pallet bed. ?!? Well, okay! I can spend $8.00 on a couple of pallets. The worse case scenario would be that I need to buy a proper bed later on. Think out of the box when buying furniture! 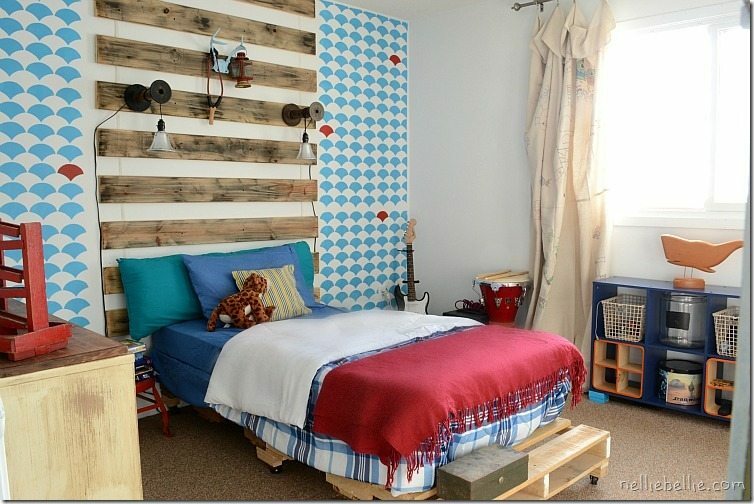 Paint an old dresser, stack pallet’s for a bed, take apart a garage sale bunk bed. Painting furniture is the quickest way to get a “new” look. Add new hardware, or wheels to old furniture to updated it even more! The second decision Levi and I made was what to spend the budget on. I needed to keep the costs under $150. So, we shopped the house and used as much as we could that was already in the room. We even used parts from the bunk bed. Creative lighting, inexpensive curtains, and creative storage ideas helped keep the budget at $120.00. I know…isn’t that great! What we DID splurge a bit on was the little window in the reading closet, new bedding, and a few finds at the antique store. Before you buy…shop your house! 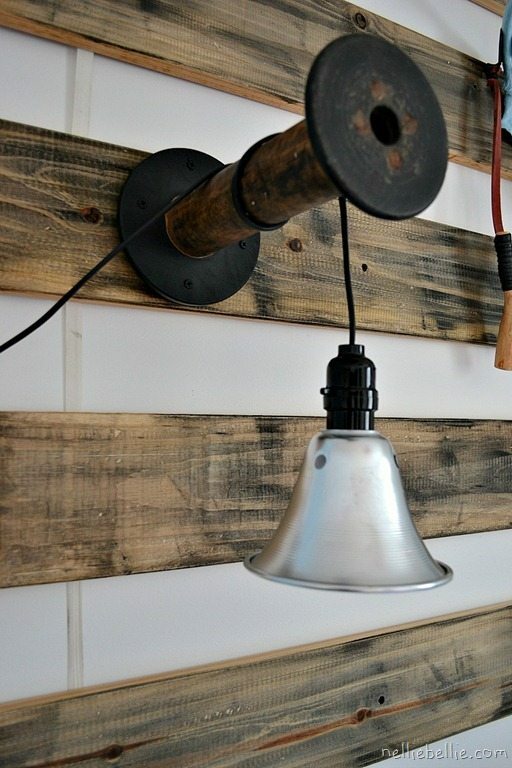 Hardware stores have great shop lights that look great in boy’s bedrooms! 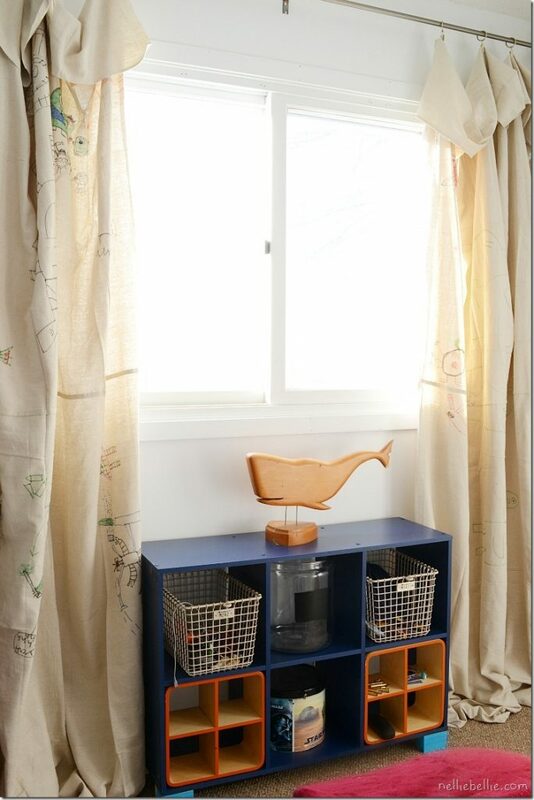 Trunks, tool chests, metal lockers, etc…are great storage options for boy’s! Custom made curtains that cost…$25.00. We used curtain rods and hardware we already had. 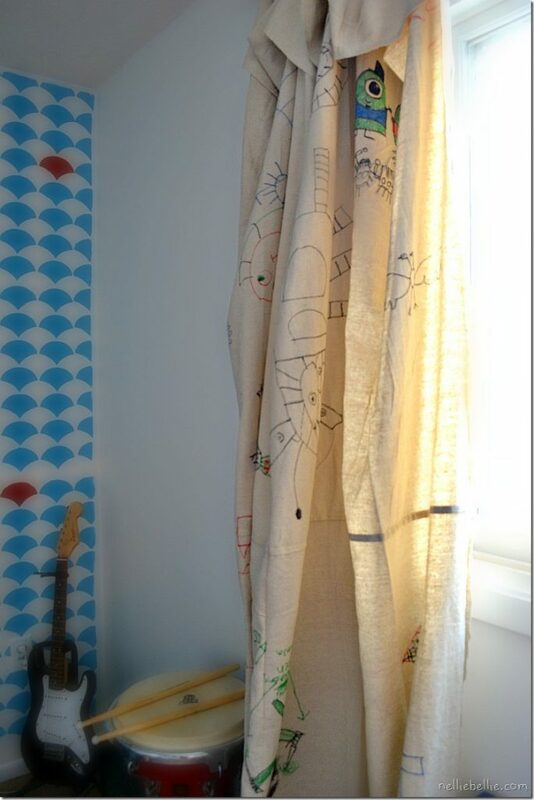 dropcloths are a great, inexpensive fabric that kids can customize with Sharpies! if you need curtain hardware…try piping from your hardware store! Shopping the house we found cubbies and various containers that fit in nicely into the squares . And that whale…oh golly, he’s cute (he was a find at the antique store)! cubbies, bins, and buckets can be found at garage sales…spray paint them a uniform color. scour your dollar store for small baskets and bins for boys to stash their “special” stuff! Do you see that ladder on the wall? It is a piece from the old bunk bed. Another repurpose! Eventually, it will be filled with knick knacks. Did you ever notice that boy’s knicky knacky things are more rock and frog-oriented then girl’s? 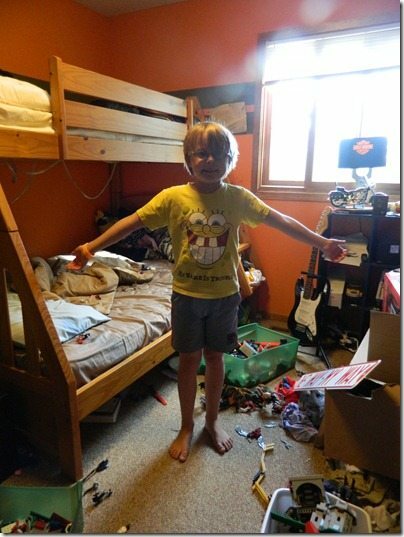 When cleaning his room I would find a rock, or twig, or piece of leg. He repeatedly could tell me what it was from and why he needed it. Oh boy. reuse old things in new ways. 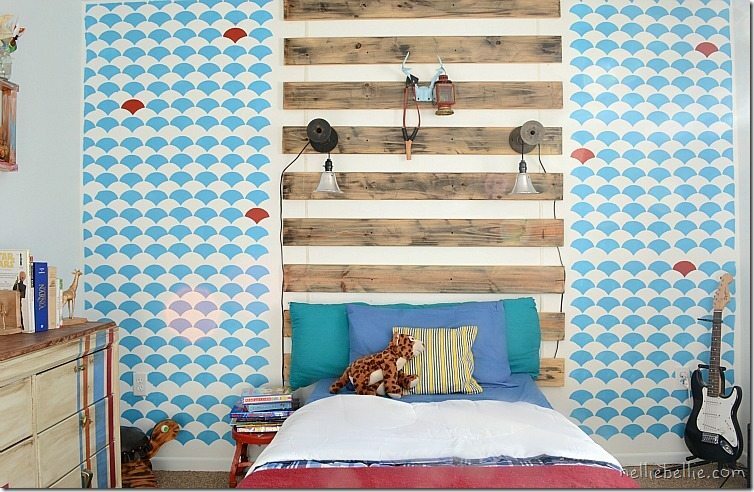 old bunk beds have plenty of wood and parts that can be repurposed! 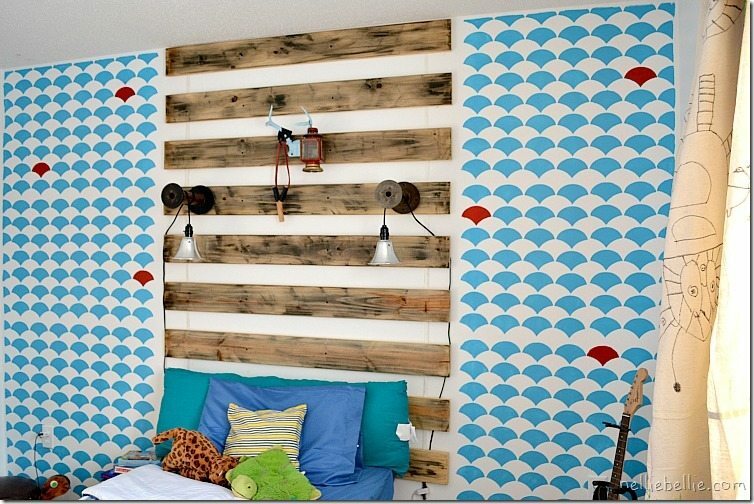 I used the fabulous Fish Scale stencil from Cutting Edge Stencils on the focal wall. It looks fabulous and gives Levi the color that he desperately wanted! try a stencil in an easy pattern for your first time. THIS ONE is similar to the one I used. 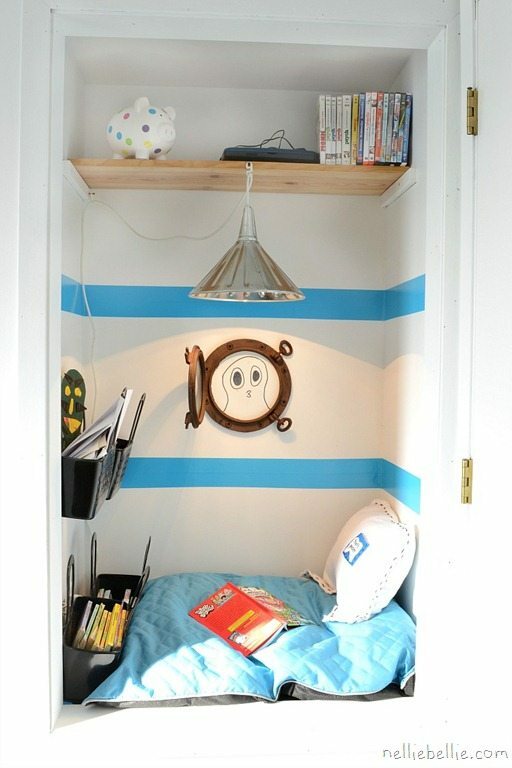 or…if you are brave…let your kid’s “draw” on the focal wall with Sharpies! 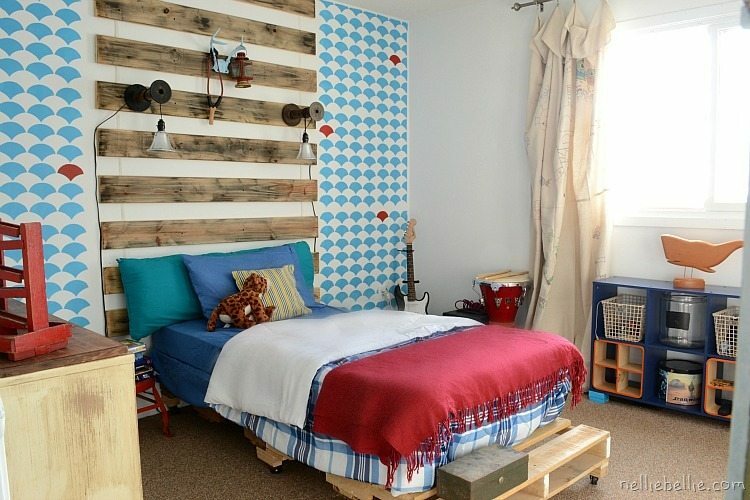 The wood behind the pallet bed…look closely!…it’s the slats from the bunk bed! Yep, I just rubbed some black stain on them to age them a bit and attached them to the wall. So cool! It gives the bed importance and keeps the room looking “manly”. 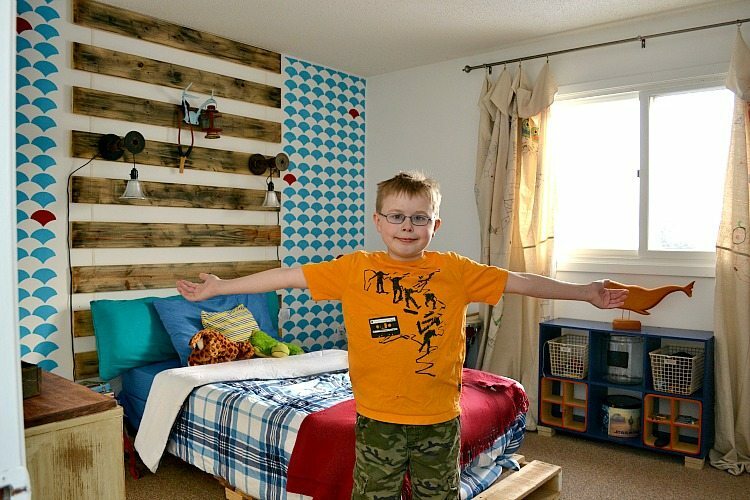 Yes, “manliness” is important when you are a 10 year old boy’s bedroom! 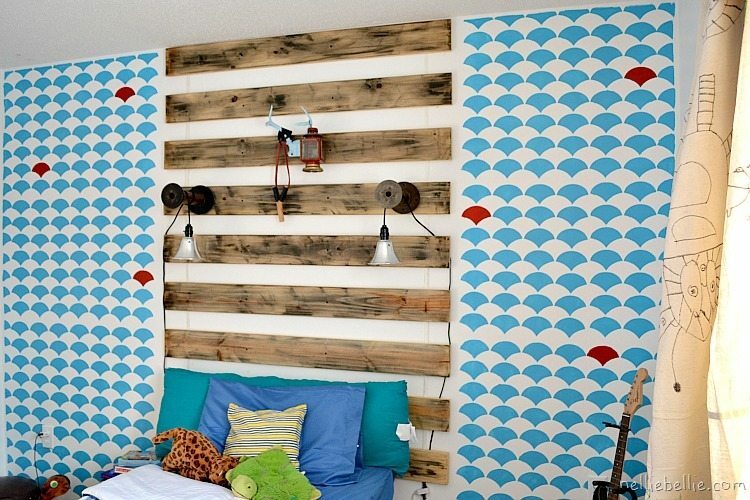 pallets, lathe, planks are great touches for boy’s rooms and a great way to cover an otherwise boring wall! No need for art. The closet you see above was being used for linens. He was more than happy to have the linens stored out of his room and the closet turned into something “proper” for a boy. We used this space to create a reading nook. if your boy’s room has a closet that they don’t use…turn it into a fun little reading space. Or, a Nerf bunker. Or, a gaming closet. duct tape works great on the wall for “stripes”! If you need a cushion for something, before you spend the big bucks …look in the pet section! I spent $20 on this versus the $40 they wanted for the same things in the “people” department. 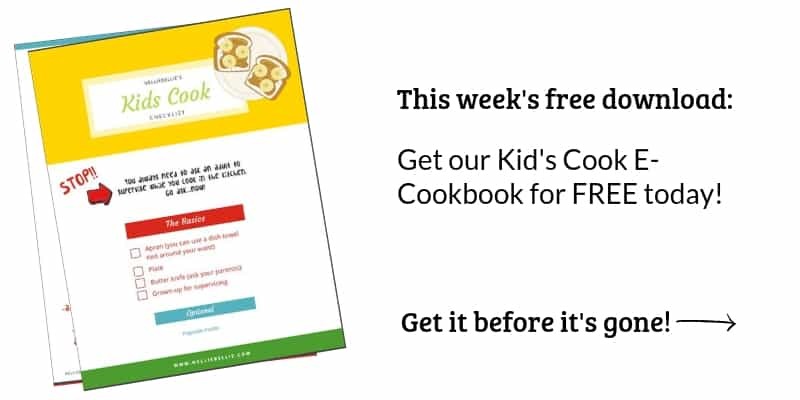 Best part…the cover is washable. The light is made from a funnel I purchased and a tractor supply store and light kit from IKEA. The blue stripes are from duct tape. 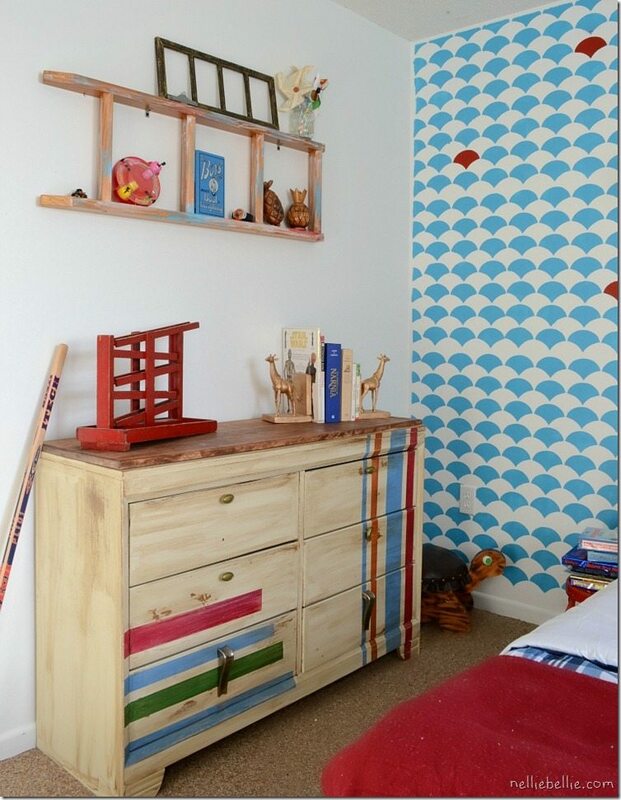 Washi tape is a great alternative for renters that need it to be removable. I know I’m going to get a few questions about the bed lights. With good reason…they are fabulous! You can read all about them HERE. And each one cost about $12.00. Love that! Levi is uber pleased with his room! He loves the colors, the bed, and mostly…the nook! Thank you for your suggestions and ideas…they helped make this space fun and practical! 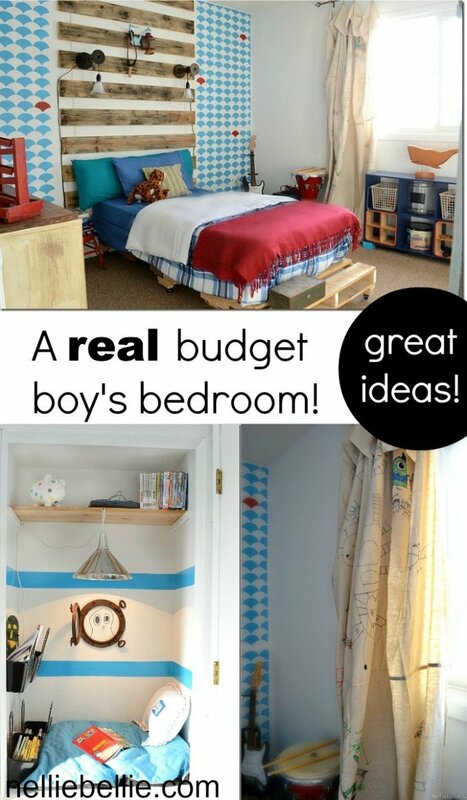 Levi’s Boy’s bedroom on a budget has been featured in Cottages and Bungalow’s June 2013 issue and in Family Fun’s August 2017 issue as well as numerous online magazines.